When Edith Cushing (Wasikowska) is a young child her mother dies unexpectedly. 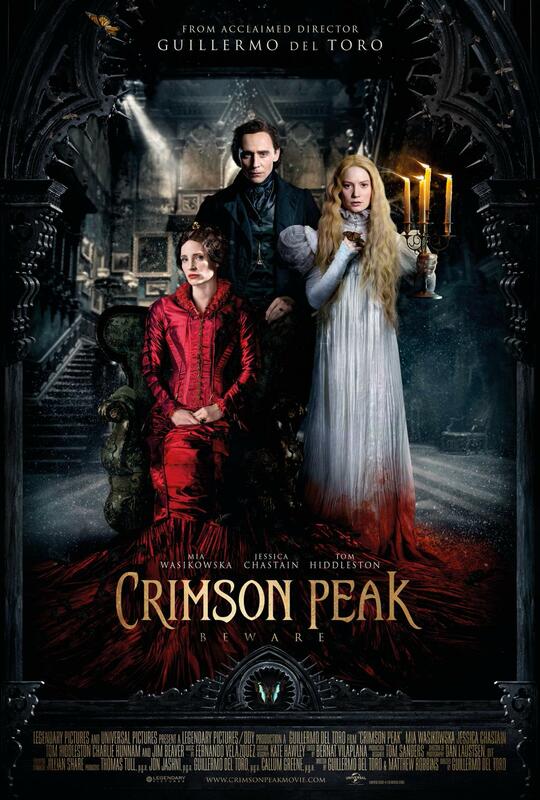 After the funeral, Edith is visited by the ghost of her mother who warns her to “beware of Crimson Peak”. Fourteen years later, Edith is trying to establish herself as a writer. She has written a novel about ghosts but her intended publisher wants her to include a romance (though she feels this is unnecessary). Her father (Beaver), a self-made industrialist, is supportive of her efforts, and lets her type up her manuscript at his offices. There she meets Sir Thomas Sharpe, a visiting aristocrat from England, who is looking for financial backing for an invention of his that will aid in the mining of red clay at his home in Northumberland. But while Edith finds herself attracted to Thomas, her father takes a dislike to him and refuses to back him. When a secret about Thomas is discovered it leads to the death of Edith’s father. Heartbroken, she turns to Thomas and his sister, Lady Lucille (Chastain) for support, and soon agrees to marry him. Together, they travel to England and the Sharpe family home, a towering gothic edifice called Allerdale Hall. The house is falling apart, and stands atop a clay mine that it is slowly sinking into. As she settles into her new life, Edith comes to discover that the house harbours secrets that neither Thomas nor Lucille want her to know about. Meanwhile, back in New York, Edith’s childhood friend Dr Alan McMichael (Hunnam), already suspicious of the way in which her father died, begins his own investigation. Plagued by ghostly visions, Edith begins to unravel the secrets of Allerdale Hall, secrets that lead her to believe that Thomas’s mother was murdered there, and that there is some connection with his recent trips to places such as Edinburgh and Milan. The discovery of luggage engraved with the initials E.S. provides a further clue that links to the visions she has. At the same time she begins to fall ill, while McMichael learns the same secret that led to her father’s death and believing Edith to be in danger, he decides to leave for England. A project that del Toro has been looking to film since 2006, Crimson Peak arrives with a great deal of anticipation and hype preceeding it, and with the enviable status of being the only movie of its kind – a gothic romance with distinct horror overtones – to be released in 2015. It’s a movie that splits its narrative in two, and in the process ends up making the first part more effective than the second, which has the unfortunate effect of leaving viewers with the impression that del Toro and co-screenwriter Matthew Robbins had a firmer grasp of what they were trying to achieve with the scenes set in New York than they did with the ones at Allerdale Hall. This leads to the movie lacking a sense of true development once we’re ensconced in the Sharpe ancestral family home. It should be the other way round but while del Toro and Robbins expand on the mystery behind Thomas and Lucille’s motives, it soon becomes apparent that the ghostly visions Edith experiences are less of a threat to her and more of a series of clues as to what has happened at the Hall in the past. With this in mind, it’s puzzling that del Toro has decided to make these apparitions as scary as possible, and in particular the spectral wraith that is Edith’s mother (played by the erstwhile Doug Jones), a depiction that seems at odds with her role as a guardian in death of her daughter’s safety – did she have to be so frightening? But while the recreation of pre-1900 New York is achieved with considerable success, it’s not until we reach Allerdale Hall that del Toro reveals the true focus of the movie: making that towering creation feel like a living, breathing character in its own right. The Hall is a triumph of production and set design, and is endlessly fascinating in its construction, with darkness leeching from the walls and corridors that look like they’ve been carved out of the vertebrae and rib cages of dead whales. Everywhere you look there’s another interesting detail to take in, some new quirk of the architecture to observe, but so good is this attention to detail that it overwhelms the story, leaving Edith’s plight of secondary importance. And with a subterranean level thrown in for good measure, the house and its “personality” become far more interesting than the pallid-by-comparison storyline involving Edith and the conspiring Sharpes (though you might wonder where all the leaves that tumble continuously through the roof are coming from, as the house is shown to sit proudly alone at the top of a hill). As a gothic romance, the movie is on better ground, with Thomas’s pursuit of Edith feeling more than expedient from the beginning, and as he becomes less and less sure of the path that he and Lucille have embarked upon, it becomes obvious that his true feelings will cause his doom. Hiddleston relays the torment and indecision that Thomas endures with a great deal of yearning for a chance to be free of his family burden, and makes the character more sympathetic than his initial actions would warrant. As the wounded and betrayed Edith, Wasikowska ensures her would-be author isn’t shown as too soft or easily dominated, but is still asked to rein in Edith’s assertiveness in moments where the script requires it. She and Hiddleston do well in making their characters’ relationship more credible than most, but despite their good work there’s just not enough passion on display to make their feelings for each other too convincing. By the time the mystery has been revealed and the machinations of the plot (loosely) explained and sewn up, the movie has descended into the kind of bloody, violent showdown that audiences will be expecting, but it isn’t the best showdown you’re ever likely to see, and it lacks vitality. Partly this is due to the pacing, and partly due to the editing, which never picks up the pace, and never seems likely to add any kind of punch to proceedings. It all leads to an oddly melancholy ending that befits a gothic romance, but not the thriller this movie has become. With so much effort having gone into the look and feel of the movie, viewers may well feel let down by this half-hearted denouement, and they’d be right to, but the movie retains a strange fascination even at the end, and one that lingers long after the closing credits. Rating: 7/10 – not as chilling or impressive on the plot or storyline front as it is when it comes to how the movie looks, Crimson Peak falls short on delivering the chills and thrills it promises to provide; del Toro has made better movies, and will probably make better ones in the future, but for now this will have to serve as a reminder, however disappointing, that there’s no one else out there who can make this kind of movie and with this kind of ardour.